I’m grading and assessing and counting down the days until the winter holidays (three more days!). It’s time for a break. I’m tired. But when it comes to research, I think I feel rejuvenated. I returned from fieldwork in Nepal in April, and I’m still making sense of my notes; met some fantastic people working in the aviation sector. All I can say for now is that it’s HARD, and I salute the people who make it all work, given the constraints and congestion. I’m working on an article and a lot of it is about manipulating space and time to make everything fit and flow. Some of these ideas were ‘tested’ at UBC in October in front of a generous audience, including a pilot. Plus, the Himalaya Program makes some lovely event posters. This entry was posted in Uncategorized on December 19, 2018 by Tina Harris. In transit to the AAA Meetings in DC. It’s been ages since I’ve been to one (5-6 years?) and I always forget how prohibitively expensive it is for grad students and adjuncts and simply anyone without a meagre conference stipend. The panel I’ll be participating in ought to be a fine one: rethinking borders from a ‘volumetric’ perspective, with some lovely partners-in-crime who have contributed to a great Cultural Anthropology series called Speaking Volumes. I write about lag. It’s crunch time now; the busiest time of the year. Grading, assessing, lecturing, conferencing, meeting, generally scrambling to Get All Things Done before the winter holidays. I am doing a very silly thing and teaching right after I land next week; straight from the airport to the classroom. I normally try to avoid this (Jet lag! Confusion! Exhaustion! Glassy eyes!) but it was impossible this time around. Wish me luck. Speaking of airports, I will be talking about them a fair amount within the next year or so; a spring sabbatical in Nepal, a round of summer research in Europe (my first time doing research outside of Asia, eek), and at the next Asian Borderlands Conference in Bishkek in late August. And then, writing. 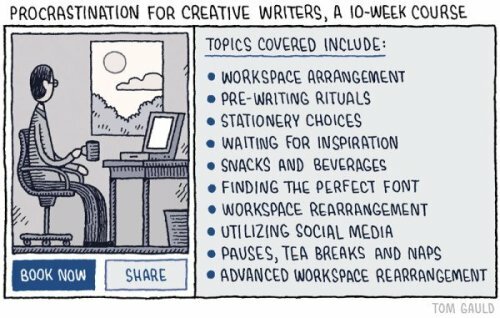 Someone recently reminded of Tom Gauld’s course on Procrastination for writers. That will be me. And my gate is called. This entry was posted in Uncategorized on November 29, 2017 by Tina Harris. I am back in my comfortable intra-Asian hybrid anthropology-geography saddle again after a surprisingly relaxing summer. This term, I’m teaching courses in the bachelors programme, the masters programme, the research masters programme, the contemporary Asian studies programme, not to mention supervising several bachelors, masters, and PhD theses. Different hats. Fingers in different pots. Tentacles in different hats. I think I am getting my idioms mixed up now that I live in the Netherlands (land of amazing idioms – for example: “Nu komt de aap uit de mouw” – now the monkey comes out of the sleeve). But I think I’ve got this; compared to last year, when I was teetering on the edge of burnout. My son is now two years old. I am no longer up all night with crying and milk and deadlines. This is not to say that I am well-rested (ha! ), but I’m happy. I think that every institution should be able to give a semester off for junior-ish faculty to recharge every two or three years. I am shifting my priorities around these days. Living in Amsterdam and cycling to work on a sunny day is helpful. This entry was posted in Uncategorized on September 8, 2016 by Tina Harris. Slightly old news, but my book was recognized by the International Convention of Asia Scholars as one of the Best Books in the Social Sciences over the past two years. This entry was posted in Uncategorized on October 29, 2015 by Tina Harris. …in two senses. In July, our department moved to a new building. We used to be in the Spinhuis, a 16th century correction house for women who would spin as part of their rehabilitation process. Someone once told me that they were convinced that the building was haunted, which reminded me of Avery Gordon’s work, Ghostly Matters, which deals sociologically with the lingering of ghosts and disappearances; “to be haunted is to be tied to social and historical effects” (Gordon 2008: 190). Sure, I miss the old tiled staircases and the student common room (now squatted and still running as a collective). But in the new building, I am learning to balance childcare with work, save for the small hiccups, growing pains, teething – the kinderziektes – such as when I couldn’t get into the nursing room at the beginning or loud drilling during lectures. But it has its plusses. I can work well in my office. It’s quiet for the most part. The social sciences are all in the same building. I have had more productive coffee-machine conversations with colleagues in the past two months than in a year. And the coffee isn’t bad. This entry was posted in Uncategorized on October 10, 2014 by Tina Harris. Well now. Since I last posted, The Book has been published, hurrah. It’s been nice to receive some email responses as well as to hear through the grapevine that some reviews are in the works. There are a whole list of online places to find it (including alibaba and walmart [?! ]), but it’s always nice to ask the library or the local bookshop to obtain a copy. I’ve since spotted a couple of silly translation errors, grr grr grr, but for the most part, it’s a satisfying feeling to finally have this monograph in hand. The 4th Asian Borderlands Conference Call for Papers has now been posted (deadline 1 February 2014), with the theme, “Activated Borders: Reopenings, Ruptures, Relationships.” It will be held in Hong Kong in December of 2014, and so far, City University of Hong Kong has been fantastic in helping to organize the event. Looking forward to it already. I’ve also just applied for some funding to do a project on mobility and small international airports. It’s somewhat of a new direction for me, but I’m extremely excited about starting a fresh project. I sort of feel like my research is heading in a more coherent direction this time around. Or maybe it’s just because I’m getting older and I’m finding any kind of jargon more and more unpalatable. Here’s a segue related to air mobility and border crossing: I travel to the UK a lot, and when I enter the aircraft, the flight attendant occasionally sees my title on my boarding pass and says something like, “Welcome DOCTOR Harris!,” to which someone behind me will sometimes comment, “Glad we have a doctor on board!” To which I end up replying, “Er, not that kind of doctor” – or when I’ve had a particularly difficult week, “Not the useful kind, I’m afraid.” This kind of exchange always calls to mind a story from a colleague in sociology, perhaps a little apocryphal, but certainly not unbelievable. During one long-haul flight, he was summoned on the PA system to head to the front of the plane. There he found a man in distress, assisted by a couple of flight attendants who looked relieved when he arrived. He suddenly realized that someone must have seen his “Dr.” title on the passenger list, and said it was the only time where he felt truly useless, and that he wasted his career. He also mentioned that the thought ran through his head that he only would have been able to help had it been a sociological emergency. It turned out that a medical doctor was on the plane as well, and my colleague was able to hold the person’s hand and talk to them until the MD arrived. When I fill in my UK landing card, I have learned to write “lecturer”, as I am not a “professor” in the UK context. Yet I am a professor in the US, while “lecturer” normally refers to a non-tenure-track position. “Assistant professor” is the usual equivalent in North America, but in other international contexts I’ve been told that it sounds like you just assist the professor, “hold her briefcase or whatever.” And my official title in Dutch is Universitair Docent (UD), which translates to “university lecturer” in English, but is part of yet another complicated nation-specific system of institutional title-hierarchy. It also means that I don’t get to wear my puffy tasseled velvet 8-cornered hat and Dumbledore-y robe at a PhD defense (not that I mind). Only full professors get to do this in the Netherlands, whereas in the US, professors of all ranks often wear regalia for most graduation ceremonies. I don’t care so much about titles or regalia, but what I am interested in – and fascinated by – is international miscommunication based on the translations of titles. “Docent” in Dutch can translate as “Teacher” in English when it is a non-research tenure-track lecturing position, but I doubt that many UK or North American job applicants would apply for the job if they just saw it was for a “Teacher.” And, what’s further, if someone from the US is asked what they do for a living and they say they “teach,” this can apply to teaching anywhere, in a primary/elementary school all the way through postgraduate level. This is much less common in a UK context – you “teach” at a primary school, but “lecture” at a university. Anyway, these are just some minor musings based on travelling between three different countries for both academic and family life. I’ve dug around a bit and found some articles that explain these situations a lot more succinctly, especially this guest blog post by Veronica Davidov on the Dutch academic job market on Karen Kelsky’s site “The Professor is In,” and a post on international academic titles on my favo(u)rite linguistics site by Lynne Murphy – “Separated By A Common Language,” concerning the differences between BrE and AmE. This entry was posted in Uncategorized on October 2, 2013 by Tina Harris. It’s “spring”. Yet there are still plenty of days where I cycle home from the office, hoping that the rain doesn’t turn into ice. It usually does. Cycling against the wind along a long stretch of cycle path with the little pellets of icy rain striking my face really hurts. But one of the many things I truly love about living in Amsterdam is the cycling, no matter what the weather is like. Cycling to pick up a bottle of wine, or to drop off the recycling, or to head to the train station, or to go out to a restaurant, or to shuttle singing children in a bakfiets to school, all helmet-less and unfazed and nonplussed. The ease and safety of cycling on dedicated bicycle lanes here in the Netherlands is actually deterring me from cycling when I am in NYC or London, at least until the infrastructure gets better and it is seen more as a regular mode of transport. This notion of an everyday cycling culture was discussed last Friday (see Manuel Stoffers’s great cycling history bibliography and a nice page of links to cycling) at a seminar that was probably the first gathering of mobilities scholars in the Netherlands. Other papers and projects involved mobile phone use in Cameroon, oil crises and sustainability, global deportation regimes, and my own thoughts on regional transport hubs as part of a new research project that I will discuss more of in the upcoming months. John Urry from Lancaster (who was also there) has a Centre for Mobilities Research and has just released a CFP for a very interesting-looking conference on Mobility Futures hosted by CeMoRe in September. In other news, I am honoured to be a new member of the editorial board of Himalaya. It is really an excellent publication for anyone doing research in various academic disciplines related to the Himalayas (broadly-defined). It publishes reports from the field as well as dissertation abstracts, which are nice options for graduate students around the world looking to publish in international peer-reviewed journals. In even better news, rumour has it that they are working towards an open access situation, something that one of my favourite journals, Cultural Anthropology, has just committed to over the next year or so. I feel strongly about this, especially having spent time with brilliant scholars, researchers, and journalists in many parts of the world who do not have access to articles in journals trapped behind expensive paywalls. This entry was posted in Uncategorized on March 16, 2013 by Tina Harris. This entry was posted in Uncategorized on December 28, 2012 by Tina Harris. The good folks at Antipode have just made available a dialogue on “new academics in the neoliberal university” on their blog/website. I was a member of the SIGJ2 Writing Collective that wrote the first intervention and then the response to Culum Canally. Not to be biased, but I think it’s a productive discussion, and not at cross-purposes – it’s also wide open for much more debate. Comments are open; please join in. It’s cold and drizzly out, and I’m swimming in the middle of a *lot* of teaching and grading. This could only mean one thing: it’s time for the AAA meetings. Heading off to SF next Wednesday, very excited about the topic of our panel on “Border Architectures”. Playing around with some new-old ideas on performance, fixed capital, and assemblages, but I have no solid idea where I’m headed yet. Hoping there will be people there to treat the panel more like a workshop than one of those traditional read-your-paper-then-leave kind of situations. Fingers crossed. For now, back to grading methods papers. This entry was posted in Uncategorized on November 8, 2012 by Tina Harris.